What: This project allows you to create an audio CD using WAV, MP3 or AIF files. Note: this procedure is not for copying already created and mastered original audio CDs. If you have already created a master audio CD in another application or this application and you would like to make additional copies, please use the Copy Disc job. Recommended for: Creating Audio CDs. 1. Select Audio from the job menu bar. 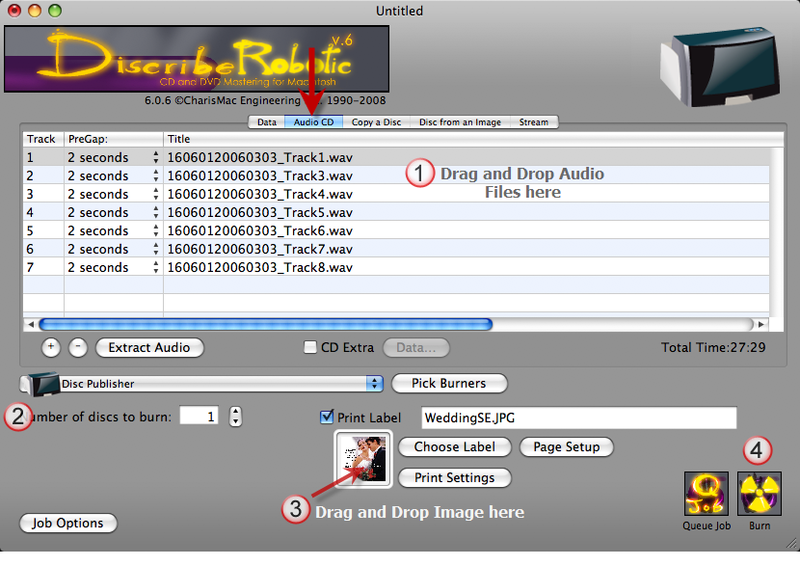 Drag and drop audio files to the audio window to add them to your disc. Drag and drop individual tracks to change track order. Click the arrows in the PreGap column to change the gap before the selected audio file. Click the + or - buttons to add or remove tracks. 2. Set the number of copies. 3. Drag and drop a print image to the preview thumbnail area. You may also click Choose Label to browse for a print image. -- Most standard image types are accepted. However, for best quality the image must be at least 300 dpi and 4.72" (120mm) square. -- Click the Page Setup and set Format For to Disc Publisher (II, Pro, XR, XRP, SE)! Set the Paper Size option to CD/DVD. -- Click Print Settings (optional) to access printer settings such as print quality, inner diameter and outer margin. 4. Click Burn to start the job. 6. To change options such kiosk mode and burn speed click the Job Options button at any time before starting the job. a. Use the Extract Tracks button only to extract individual tracks from an audio CD onto your hard drive for use in your Audio Job. b. Only choose tracks for an Audio Job that are located on a hard drive. Never choose tracks for an audio project that are located on a disc in a drive. Use the Extract Tracks feature to extract them to your hard drive. c. Check the CD Extra box to add a data session to your audio disc. This data session will be available if the audio cd is placed in a computer disc drive.